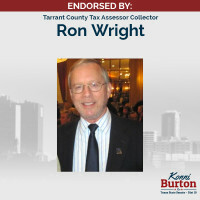 We are excited to announce the endorsement of Tarrant County Tax Assessor Collector Ron Wright. Wright has been a public servant in Tarrant County for over three decades, serving as a member of the Arlington City Council, a weekly columnist for the Ft. Worth Star Telegram, and a long-time GOP leader and delegate to the Republican National Convention. Wright’s endorsement is the first significant Tarrant County endorsement since Burton’s strong first place finish in the GOP primary on March 2nd. Burton’s campaign stands alone in the GOP runoff in being able to engage and excite voters, and has used a wide network of volunteers to run an impressive grassroots campaign.